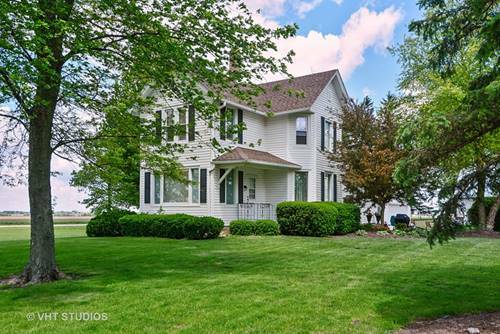 SUCH A CHARMING FARMHOUSE, YOU'LL WANT TO CALL IT YOUR OWN!! Fresh on the market!! Gorgeous hardwood floors and built ins will immediately wow you as you enter this modern farmhouse. Build a fire and enjoy the coziness of the family room. This property has been incredibly maintained and lovingly cared for. Beautiful crown molding and nice trim package throughout home. Full, clean basement. Professionally landscaped with beautiful, welcoming patio. Outbuildings include 40 x 80 barn, 40 x 40 workshop with two garage doors, and enclosed 40 x 30 corn crib. Buildings has water & electric & cement floors. Property is zoned AG with very low taxes. Close to Elburn Metra station, only 30 minutes to Fox Valley area and 15 minutes to DeKalb and NIU. For more information about 16053 Owens, Hinckley, IL 60520 contact Urban Real Estate.